What can I say? 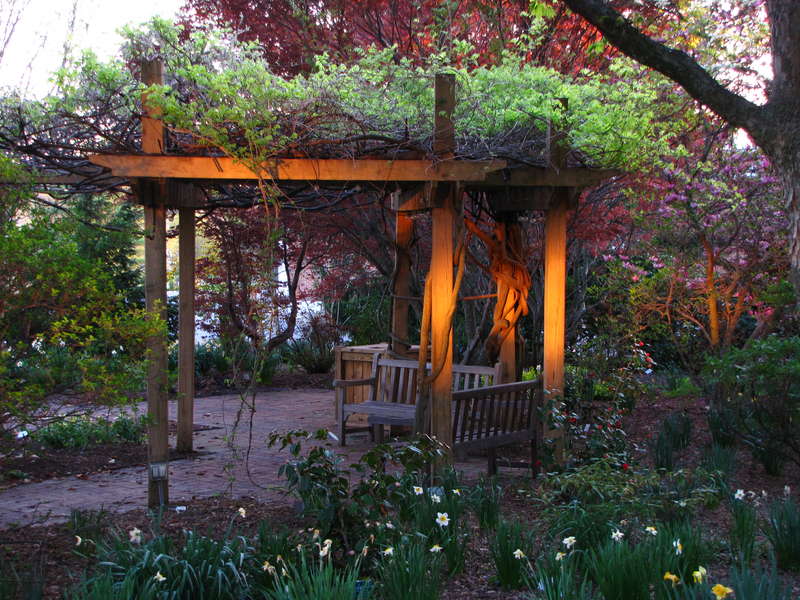 I really enjoy going to the Horticulture gardens on campus, especially when the sun is going down. The flowers are beautiful this time of year, and the late day sun makes for some excellent light. I think the coolest thing about this shot is that the light on the gazebo is not direct sunlight, rather it is reflected off of a building at least a quarter mile away. The sun is actually behind the tree you can see in the top right corner. As I was walking through the gardens, I noticed my shadow being cast on the columns, and didn’t think too much of it until I also realized that the sun was actually on the other side of the gazebo and couldn’t possibly be the light source on this side of the structure. It’s a shame that the top corners of the image got blown out, but I wasn’t able to get a good shot that got the orange color of the sky as well as all of the colors of the foreground. I guess I could have tried the ND filter, but I wouldn’t have been able to steady the camera for the longer exposures without a tripod. As I said last weekend, I have been working hard on my math research project for the semester. I ended up creating a new blog page to post some of my research write-ups. Click the “Research” button on the navigation bar above for a quick overview, which will be expanded as I find the time to work on it, and one of my more recent pieces. The weather in Blacksburg seems to have finally changed for the better. Today was beautiful, clear blue skies and temperatures in the mid-60s. After finishing one of my big assignments for this week, I decided to head out and take some pictures. On the way out to the duckpond, I noticed a few flowers beginning to bloom along the side of the road. I then changed my destination to the Hahn Horticulture Gardens to see if there was anything blooming there as well. Unfortunately, there wasn’t much, but what there was was a welcome sight after almost two months of snow on the ground. I’m not sure what kind of flowers these are, but I really like the way this picture came out. Shot in super macro mode leaning across a bed of flowers that had not yet bloomed, I was worried that these would turn out too shaky, but I guess the image stabilization in the camera did its job. I love the colors in this shot, the green, the orange, and all the different shades of purple from the sun shining through some of the petals. It is refreshing on a large number of levels to see things blooming again. 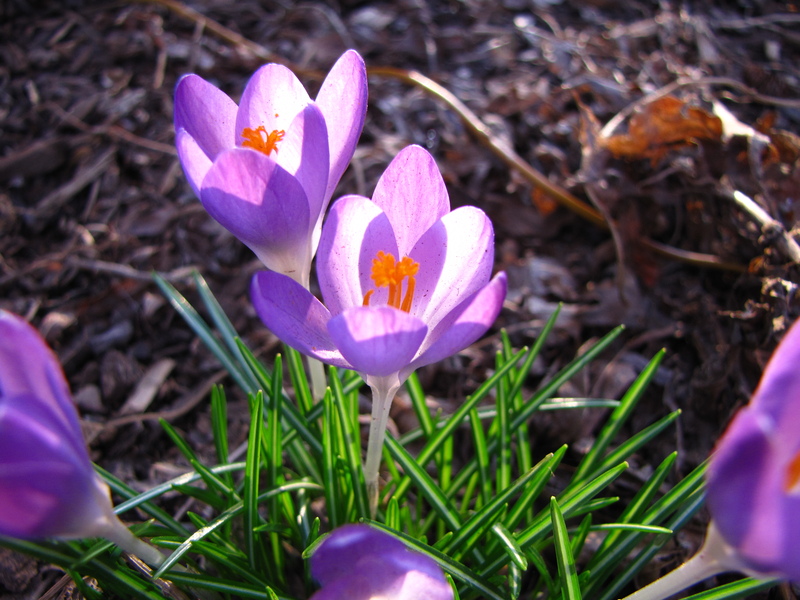 It means an end to the dreary, gray days of winter, and a return to the warmer, more colorful days of spring and summer. It means an opportunity to spend more time outside rather than huddled in the warm buildings. Unfortunately, the coming of spring also means that the semester is quickly coming to a close. I will report that I made a decision about my summer plans, and will be attending the mathematics REU at Oregon State. Though I won’t be making that much over the summer, I think this is the best choice for me in the long run, and that it will give me a better indication of what I want to do once I graduate. 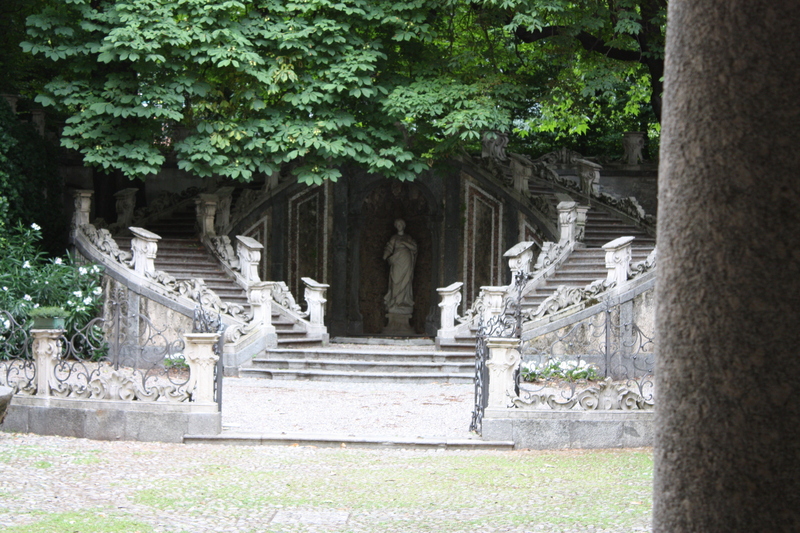 This photo comes from the central courtyard of the Museo Civico in Como, Italy. Like the one in the last post, it was one of my favorites from my trip this past summer. I’m not entirely sure why, but I really like having the column in the foreground on the right side of the image. I apologize for it not being quite straight, but I’m working from the road again and don’t have any good photo software available to me on the laptop. The past week has been another busy one. I was in Dallas last week for an interview with Lockheed Martin for a summer internship and made it back to Blacksburg late Wednesday night. Thursday and Friday were mostly full of work, catching up for what I had missed. Saturday was a great day. In the afternoon, I headed out to Radford to meet one of my best friends from high school who happened to be in town. Saturday night, I took a friend to the “Second Chance Valentine’s Dance” hosted by the swing dancing club. Being a semi-formal event, it was the first time in a long time that I’d had an excuse to get dressed up for a dance. I had an amazing time, and the live band that performed was excellent. The real world caught back up to me Sunday, and I spent most of the day working on homework and my research project. Since then, the last few days have flown by, and I’ve been working hard to get all of my work done early for the week in order to prepare for my latest adventure. This afternoon, I flew to Baltimore where I’ll be spending the next two days interviewing with the NSA for a summer internship. I mentioned in my post last week that I had been a little overwhelmed by a sense of anxiety and stress while going through the airport, especially the one in Charlotte. Well…I happened to find myself there again today and got the same feeling. Luckily, I had plenty of time to make my connection there, and didn’t have to rush from one end of the airport to the other. It did make me think about some of the different ways that people have to deal with stress in their lives. I am certainly no stranger to being stressed, and have had to find ways to get rid of it. One of the ways that I have developed, and I’m sure it’s a pretty common one, is to remove yourself, mentally if not physically, from the stressful situation. Finding a place to go where you can just sit and relax, sorting through your thoughts if necessary, is a great stress reliever. 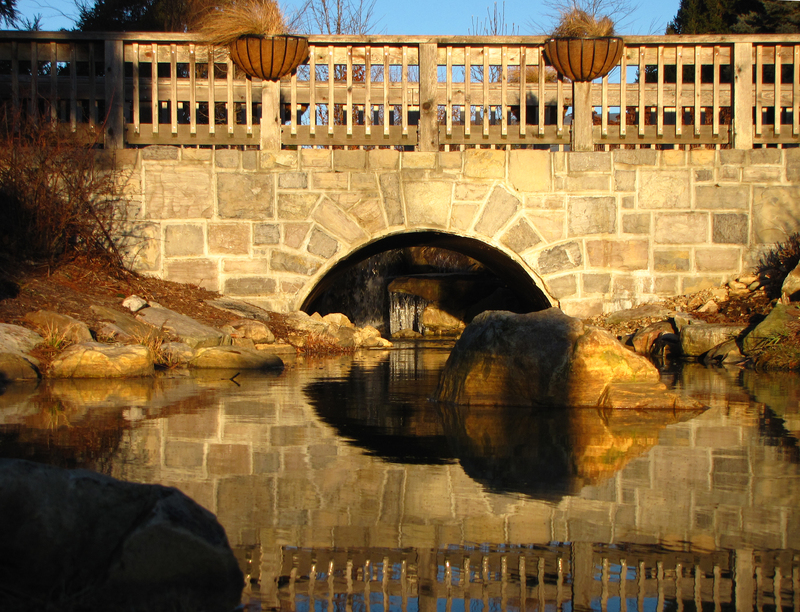 I am lucky enough to have discovered several such places around campus that I can go when I feel overworked or on edge. However, the visualization of a calm, peaceful place, or one that you associate with a feeling of serenity can do a world of good as well. The scene in the image above is one of those places for me. While we certainly had work to do while we were visiting the site, I still find the image of the courtyard to be awfully peaceful and calming. Another scene I turn to is that of the lake near my aunt’s cabin up in the mountains on a clear night. You can look up and see all of the stars, then look down and see their reflection on the surface of the lake. Unfortunately, I don’t have a physical picture of that place, just a mental image that is still relatively fresh from my visit there this past summer. Well…I should probably get some rest before my interview tomorrow. There may be another post tomorrow afternoon or evening depending on how much free time I end up having. I won’t pretend to know a lot about art, my only real academic experiences with it being an art history course last fall and some on site information from the Beckers this summer. But to me at least, it is a very haunting piece, brimming with both longing and regret, as if she has just lost something very dear to her. The nature of the sculpture also adds to the effect. There are no smooth curves at all in this sculpture, only sharp, angular cuts, creating a figure of purely flat surfaces. I think it serves to immediately put a distance between the sculpture and the humans viewing it. In human-like sculptures we look for things we can identify with, things that remind us of ourselves, in a way things that affirm our own humanity. By having a sculpture, especially a female one, be made of hard geometric shapes like this rather than the soft, gentle curves we tend to associate with women it is much harder for the viewer to make a connection with the subject. Rather than a benevolent, welcoming figure, we (or me at least) unthinkingly assign to it a negative emotion such as loss or regret rather than a more positive one such as sympathy that we might bestow on a figure that we could relate to on a “human” level. But she is the only one in the scene, we really have no way of knowing what she’s gazing down at, if anything at all. Is she mourning the loss of a loved one? Is she a worried mother standing over an injured child, full of worry and love? Is the subject of her concern something physical and concrete at all? We watched another very interesting video for our TED talk colloquium tonight. The talk (http://www.ted.com/talks/carl_honore_praises_slowness.html), given by journalist Carl Honore, advocated a “slowing down” of our arguably fast-paced society. It struck a particularly strong cord with me as I watched it, as it had been something I’ve given a fairly good amount of thought to before, and kinda written about here before. The basic gist of the argument is that the best way to get more out of the time we have is not to try to pack as many things into it as possible, but rather to try to get more out of the things we do. More what? A simple question, but one without an equally simple answer. More enjoyment, more fulfillment, more meaning, just more. I see this as deeper than just an “enjoy the simple things in life” message. Another point he seems to make in the video is that eventually our fast-paced lives catch up to us, we reach a breaking point, and once we reach this point, we either make an effort to slow down or risk truly burning ourselves out. Our lives are full of stress, regardless of whether we are in school or out in the workforce, but we all try to find the best way to deal with it. However, it never seems to really go away, and over time it builds up inside us until it can manifest in some physical way, be it a sickness that forces us to take it easy for a while, or an emotional outburst, whose consequences can, and should, lead to a reflection about their true cause. This can be that crucial breaking point. If we ignore what our bodies and minds are trying to tell us, drown them out with neverending work and worry, the consequences can be catastrophic. I think I reached one of these breaking points last spring. Overwhelmed with work and a couple of personal issues, and without a real way to remove myself from the stressful situation, it felt like things were falling down all around me. There was a week where all of my deadlines and responsibilities seemed to converge. I made it through the week, but paid for it that weekend. I remember not being able to do much on account of some particularly bad headaches. But while this weekend was certainly not productive on an academic level, it made me slow down, really stop and think about things. I know I’ve talked about this here before, but I realized that my priorities were not in the right order, and had been skewed for quite some time. Getting a B in a class wasn’t going to kill me, it wasn’t the end of the world, and I really needed to cut myself some slack personally and academically. I took a pretty deep look at what my motivation was for all of the things I was doing, realizing that a good deal of them were pretty superficial, doing the activity for the sake of doing the activity, and not really getting anything out of it. I had to look for my “focal activities,” which I talked about a couple of posts ago. Since then, I have tried, and it is very hard at times, to slow myself down. Breaking out of a mindset in which I’ve been fairly firmly set for the past five or six years has taken, and is still taking a good deal of effort on my part. It’s not something we can simply switch on or off, but requires a change on a much deeper, more fundamental level. But it’s a goal that I feel is worthy of the effort it requires. Anyway, I have a tendency to ramble when I’m up too late past my bedtime, so I think that will have to do for tonight.